Five years in the making, Jeff Greinke’s newest release BEFORE SUNRISE explores the more acoustical side of the ambient / impressionist territory of the electronic music genre. This new work, the third Greinke title on the Spotted Peccary Music label, is a logical progression from his previous releases, painting abstract landscapes and emotive expressions with ample use of acoustic instruments such as piano, cello, viola, clarinets and vibraphone, along with electronic elements of sampled textures and synthesizers. The expansive palette of these rich timbres bring a fresh perspective to this highly nuanced contemporary electro-acoustic sound. Spanning genres of modern classical, electronic, and ambient, BEFORE SUNRISE is always evolving, flowing pastorally throughout a predominately non-linear structure. These improvisations and compositions sway to-and-fro, effortlessly creating an authentic, organic quality to the musical experience. Evocative recording techniques, like capturing the incidentals of string and bowed instruments, conjure a lonely, desolate, melancholy terrain. 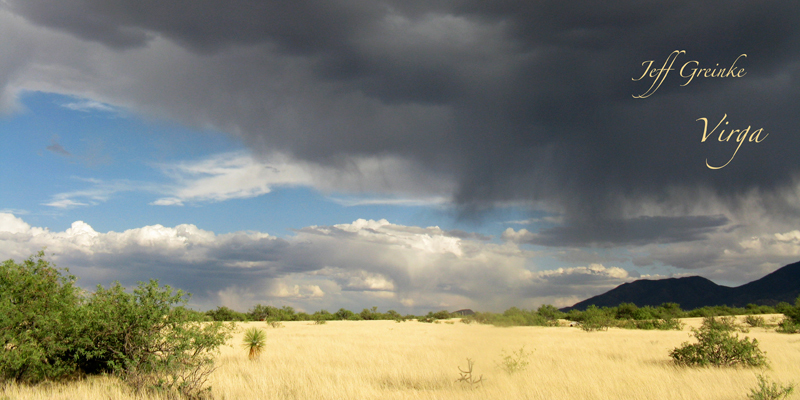 Greinke adds, “my music and creative process is inspired by my visual, aural, and sensual (particularly meteorological) experiences of the world around me.” Due to this inspiration, the eight tracks that comprise this new album are mostly void of any clear rhythmic component and yet pace gracefully, almost floating majestically with Greinke’s intention and direction. Highly layered and textural, BEFORE SUNRISE is impressively spacious with an abundance of subtle detail, while evoking a remarkably somber and visual sense of place. An exquisitely nuanced collection of ambient chamber music, Before Sunrise blurs the lines between classical and electronic genres in the most striking manner imaginable. Jeff Greinke’s been crafting music and releasing recordings for decades, and the sensibility the sound sculptor, artist, and designer has refined over the course of that production period is evident in every fibre of the recording’s being. A project like Greinke’s that pairs live musicians with electronic textures and embeds their playing within soundscape structures can produce a result where the contributions of the acoustic players feels grafted onto the backdrops crafted by the electronic artist. Not so here: Before Sunrise sees the two components integrated seamlessly, with all elements working in tandem to achieve specific ends. No account of the fifty-seven-minute release would be complete without acknowledging those who so splendidly augment Greinke’s keyboards, electronics, and samples, even if their contributions appear on only half of the album’s eight pieces: string players Paris Hurley, Alex Guy, Austin Larkin, and Dylan Rieck; trumpeter Lesli Dalaba, woodwinds players James DeJoie, and Greg Campbell on French horn, vibraphone, and hand drum. Establishing the album’s tone, Greinke builds a multi-dimensional meditative space using vibraphone, bass clarinet, strings, samples, and electronics in “High Flyers of the Night Sky,” its sense of mystery nurtured with masterful patience by the composer. Amidst the thrum of insects and the low-pitched utterances of the bass clarinet, the trumpet’s sparse declamations call to mind the similarly lonely sound of the horn in Ives’s The Unanswered Question. Such an association aside, the material exemplifies the meticulousness with which Greinke assembles his elements into painterly wholes. Track titles aren’t without a programmatic dimension, but even if generic titles had been used the pieces would still be strongly evocative. Strings figure prominently in the arrangement of “Slow Train on an Open Plain,” lending the piece an elegiac character that very much conveys qualities of loneliness and desolation. By comparison, the combination of muted trumpet, hand drum, clarinet, and electronics gives “The River” a somewhat exotic, even Fourth World character that suggests affinities with the music of Jon Hassell or David Toop. With respect to the solo productions, “Night Watch” is Greinke in deep Eno mode, the atmospheric ambient soundscape powerfully suggestive of a nocturnal harbour setting when the only sounds intermingling are those of wind and water. Using acoustic piano as the front-line instrument in the peaceful, New Age-styled reverie “Rain, Then Snow” adds a wholly different dimension to the recording, as does the prominent role accorded DeJoie’s flute in the slow-motion title piece, a move that deepens the quiet grandeur of a twelve-minute moodscape that in its closing minutes approaches the profound stillness of an Arvo Pärt composition. Nuance and sensitivity extend not only to the material itself but to the recording approach Greinke applied to the project. By design, the string instruments were recorded in such a way that the extra-musical sounds that naturally arise during performance, such as the sound of a bow moving across the strings, would be retained. In the composer’s own words, “I instructed the musicians not to shy away from squeaks and scrapes that sometimes happen while playing such instruments … I find that those sounds evoke a lonely, abandoned landscape that appeals to me.” The result is music obviously rich in texture and mood but music rich in humanity, too. An artist cannot really be represented by a single release, but rather is suggested through an accumulation of work. Throughout his lengthy and varied career Jeff Greinke has gone through an evolution – or maybe, because of its length and so many interesting twists and turns, this aspect of his life may be better described as a convolution. While his earlier albums searched through the rubble of the unconscious, Before Sunrise(57’20”) switches from the cerebral to the specific. With the rigorous organization of the interplay of texture, melody and harmony, and stemming from a developed instinct, he organizes Ambient forms to give his creativity a lucid expression. As usual, Greinke approached the task of producing Before Sunrise with a point of view all his own. Due to the presence of cello, clarinet, piano, vibraphone, flute, French horn, violin and viola this release may be thought to fall in the category of Ambient Chamber Music – and certainly, if you like this sort of thing, then you will not be disappointed. But Greinke has always been a musical outsider – not even faintly trying to get inside – and so these eight tracks do retain that feel and integrity to one degree or another. Some sections of Before Sunrise flow like a spiritual quest for life’s meaning, while others celebrate the outlaw life this remote genre of music may support. As the unwinding ribbon of notes from a violin bend plaintively, droning strings support a melodious narration. Further in a wooded wild place materializes, where we wait, under stars, in the cool of night, well in advance of the first sign of dawn. Thickening under a solemn atmosphere, we may feel a nocturnal presence – like something impending. Possessing the capacity to inspire contradictory responses, it is often very gorgeous – this strange and beautiful wayward place of sound. After all these years, decades of making records, Greinke still asks for nothing more than our quiet attention. There is something radical about that, and about such stubborn faith in one’s work – and in us. 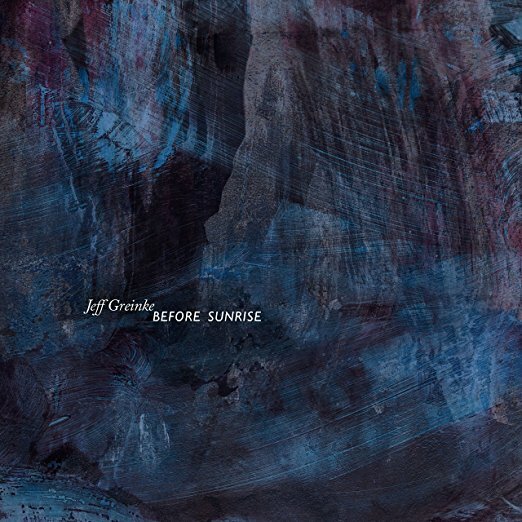 Before Sunrise’ marks the 20th solo album for ambient artist Jeff Greinke, not counting his collaborations. It’s a shame that a number of them are out of print, although there have been some reissues. I first experienced Greinke’s work in the late ’80s to early ’90s and so am familiar with only a handful of his recordings. What I liked about them is that they seemed dark and arcane at the time; not dark in a Robert Rich or Lustmord sort of way, but less conventional ambient than what others in the genre seemed to be doing then. If you’ve been out of touch with Greinke’s music as well, you will find that it has evolved into something quite different, yet not without retaining the flavor and texture Greinke is known for. Greinke’s crepuscular vision of ‘Before Sunrise’ is a rich tapestry of acoustic instruments played by guest players (Greg Campbell- French horn, vibraphone, hand drum; Lesli Dalaba- trumpet; James DeJoie- clarinets, saxophones, flutes; Alex Guy- viola; Paris Hurley- violin; Austin Larkin- viola, violin; Dylan Rieck- cello) combined with Greinke’s signature electro-acoustic atmospheres and keyboard improvs. It’s an impressionistic kind of ambient, fairly well removed from the New Age melodic ambient you might expect to hear with orchestral instruments combined with synthesizers. This is a pretty deep work with a number of moods and soundscapes explored over the course of 8 tracks in 57 minutes; everything from rumbling darkness to splinters of moonlight piercing through a many-layered forest of sound, to sparkly fairy lights. By its nature, ‘Before Sunrise’ has an aura of melancholy mystery to it that always seems to be evolving. It is almost hard to believe that the music has been largely improvised as the instrumental coordination is so stellar that it often seems as though there had to have been some rather complex arrangements in places. The layering of atmospheres is extraordinary in its richness, yet nothing is buried. Rather than overtake Greinke’s atmospheres, the acoustic instruments enhance it and add their own piquancy to what is already a pretty heady stew. ‘Before Sunrise’ is a trip well worth taking, and is intriguing enough to warrant multiple replays. He’s been actively recording music since the early 80s, with well over two dozen releases to his credit, yet probably not as prolific as some others in the floating ambient subgenre, but his creations are clearly different, embracing acoustic instrumentation as a fundamental part of his electronic based sound, thereby often making his music a hybrid of chamber styles and ambient electronics. I’ve not heard every release, in fact probably only around ten of them throughout the years, but they all seem to follow along in that general direction. Before Sunrise makes good on all of his previous endeavors, seeming to be a very natural progression along a somewhat expected trajectory. Each of the eight tracks of varying length stay around long enough to make an impressionistic statement without wearing down the listener with endless or unnecessary repetition or extension. The nine-minute opener, “High Flyers of the Night Sky,” is probably one of the most purely floating and subtle electronic amont them all, but even there, among the gentle keyboard sounds and textures, we hear strong melodies emerging from the drones in the darkness, flanked by baritone sax from guest player James DeJoie, french horn from Greg Campbell, trumpet from Lesli Dalaba, and soothing violin from Austin Larkin, such that by the end of the piece we are treated to a truly colorful and mystical kaleidoscope of light and shadows. “Slow Train on an Open Plain” is a perfect title for the follow-up track that emerges out of the shadow of the first, here more string-driven with violin, viola and cello, with french horn driving the main melody punctuated by beautiful piano ornamentation. “Under Falling Stars” is a piece that proceeds with a stong melodic looping cycle, it’s all Greinke here with no guest players, using a wide variety of keyboard sounds together with samples of acoustic instruments. The perfectly titled “Mountains and Clouds” evokes a moving stillness bathed in fog, a sound that Greinke has been perfecting over several decades, the changes within this beautiful six-minute piece move at a truly glacial pace. The 12-minute closing title track evokes the sounds and feelings of night, with flute, horn, baritone sax, and violin floating through the electronic textures and piano accents, like the shapes of muted colors and subtle powers emerging from the fringes of darkness. Make no mistake, this is relaxing music, be it a ticket to slumberland or a way to start your day without stress. Another excellent release from a master of organic structures. Mixed by Jeff Greinke except tracks 1 and 3 mixed by Doug Haire and Jeff Greinke. Recorded at Wavelab, Tucson, Arizona (engineer: Chris Schultz); Another Room, Tucson, Arizona (engineer: Jeff Greinke); and Jack Straw, Seattle, Washington (engineer: Doug Haire). Cover and insert photography by Isabel Amorous (except photo of Will Clipman copyright Gabriel Ayala). The time runs fast, already four years have passed since Jeff Greinke’s “Virga” album, released on Lotuspike. For all that time I didn’t hear anything about this extraordinary artist, who is based in Tucson, Arizona. So the more surprised I was when “Scenes From A Train” CD crossed my radars via Hypnos Forum (thanks “Immersion” for the hint!!!). Yes, this release went by quite unnoticed within broader ambient community, it’s a pity, because it deserves much bigger exposure even if it’s not rooted to Jeff’s older, more spookier ambient/dark ambient soundworlds. “Scenes From A Train” CD rather follows footsteps of his rhythmed, jazzy-infused side project Land. Released in June 2013 on UK label Infectious Music, Jeff Greinke is supported on this album by the long list of guests (there is no less than 13 of them!!!). Among them some which were part of above mentioned Land project. Filigree musicianship is heard all over this entertaining sonic escapade. Richly flavored textures, merging warmer scenic vistas with lots of acoustic instrumentation and cascading from funky jazzy rhythms through weirdly tribal fields to sorrowful cinematic subtleties. Appealingly moving jazzy-funk/tribal pace of the opening title track “Scenes From A Train” immediately sets the atmosphere of a picturesque railroad travel. Bowed string mastery excels on sadly expressive piece, “The Beautiful Storm”, while the next one, “Valley And Ridge” shifts back to rhythmed rails, where sparkling percussive tinkles with gentle clackers and shakers beautifully interact with the variety of bowed strings and wind instruments. Catchy laid-back train-like pace is achieved, while mingling with warmly inviting window’s horizons. Pure beauty!!! Breathtakingly evocative mixture of trumpet, clarinet and viola leads “The Milky Way”. Few dramatic crescendos sneak in throughout this stunningly expressive track. Small amount of exquisite Middle East fragrance is thrown in too (evoking unforgettable “Ngaio Gamelan”…). Deeply immersing cinematic realms are fully unfolded, more please!!! An ultimate Hall of Fame composition!!! Jazzy and tribal ingredients are again bridged in “Strange Birds”, a piece driven by percussive downtempos, piano, cello and wind instruments. Hauntingly sculpted!!! “Haboob” keeps on the distinctive route with all the guitar and acoustic mastery, heavier post-rock infusions are featured in this oddly unique piece. Fortunately, aptly titled “Night Train” returns quickly to relaxing tribal mood surrounded by the interactions of trombone, clarinet, horn and distant dronescapes. Very nice!!! The album ends with “Autumn Moon”, which features leisurely embracing and rhythmically stirring texture, augmented by velvety tinkles and female wordless ethereal chants. A truly enthralling finale!!! “Scenes From A Train” album offers an all-inclusive, highly distinguishing travelogue experience, presented by challenging creativity of each participant. Jeff Greinke has teamed with many virtuoso performers, who have delivered to this recording their soul and spirit. Aural bliss awaits here, definitely!!! Excuse me for not mentioning any names of the guests in this review (plus mixing and mastering engineers), but it’s the music that speaks for themselves and I didn’t want to leave someone out. And I award extra points also for the visuals, the 4-panel digipak comes with additional 8-page booklet, precisely displaying the theme and dedication of each performer. The old Jeff Greinke is gone, that’s for sure (at least on this album), but “Scenes From A Train” CD is a really big one as well, welcome back, Maestro!!! Virga is the eighteenth release from Jeff Greinke, whose respected career as a musician, composer, performer and sound-sculptor spans 25 years. With a discography that includes album titles like Weather From Another Planet, Cities In Fog, Big Weather, Changing Skies, Moving Climates, and Before The Storm to name a few, it’s clear that Greinke draws great inspiration from the atmospheric conditions of his environment. “This music is informed by my visual surroundings, primarily the landscapes, big skies and weather of the desert Southwest,” confirms Greinke, who currently resides in Tucson, Arizona, where the Virga phenomenon is common during the monsoon season. The music on Virga takes shape as strata of slow moving melodies stream their way through expansive atmospherics and pastoral passages of ambient chamber music, highlighted by cello, trumpet and piano on many selections; all drifting together to construct complex harmonic musical skyscapes. The cumulative result is a collection of vast, textural, cinematic, and melodic compositions with a strong sense of mood and place that gently evolve and drift… like the clouds themselves. To these ears, Virga, the latest offering from Jeff Greinke, is a stunning soundtrack in search of the touching, beautiful, meaningful film to which it should rightfully belong. A neo-classical work edged with ambient expressions, Virga is emotionally packed and gorgeously constructed. It’s engaging from the first spattering of here-comes-the-rain notes in the opening title track and proceeds to just get deeper and more interesting from there. Greinke has always composed with a strong cinematic flair and that, along with his stated intent to capture the feel of the environment as a storm approaches, carries clearly through all the pieces on Virga. In “The Wake,” Greinke conjures darkening skies in a slow-moving, somber tone. I love the Asian-flavored edge at work in “East Facing Slope.” (Similarly, I enjoyed that same feel in “Moving to Malaysia” from Winter Light.) There’s a strong Mark Isham quality to the track–think Tibet–that makes it the musical equivalent of staring into a Japanese pen-and-ink drawing or watching the colors darken on a mountainside as weather rolls in. “Before the Storm” deftly captures its titular image as woodwinds swirl like gathering clouds and distantly rumbling bass notes carry the blue-black threat of hard rain. “Contrails” is suitably light in tone, with wispy piano notes and high synth strings describing washed-blue skies and the return of the sun. By contrast, its followup track, “Partial Light,” imparts an edge of drama with an abundance of minor chords, long-held notes and phrases that ease down the scale in short steps, all with a gentle rush of wind beneath it. There’s a pure and gentle romance to the stilted structure of “Old Friends” that quite honestly threatens to move me to tears. Greinke’s master craftsmanship is on display here, track after track. Every piece of work here is rich and full, landscapes completely described in intimate detail while still leaving space for you to create your own mental pictures. This is a disk you’ll return to often to re-explore, and it will easily stand up to the scrutiny. For its depth and beauty, Virga is a Hypnagogue Highly Recommended CD. 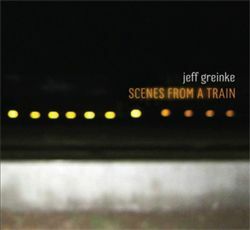 Jeff Greinke (joined on several tracks by cellist Christiana Morgan and trumpet player Lesli Dalaba) continues to evolve his music away from his more abstract and textural ambient beginnings, choosing to explore a more melodic neo-classical minimalist landscape on Virga, his latest CD and, from where I stand, one of the best recordings of his long career. While some cuts are less overtly “soundtrackish” than his previous CD, venturing into ambient soundscape territory, I believe that the overriding musical presence here is still closer to that of Winter Light and, to a lesser but still noticeable degree, Wide View, than it is to past works such as In Another Place, Places of Motility and Cities in Fog. I’m well aware that some of Greinke’s long-time fans are somewhat discouraged by this new direction he is headed in, and they are entitled to that opinion of course. However, baring the obvious statement that an artist must answer the call of his/her muse if he/she is to be true to his/her musical self, I think this new direction represents a greater depth of emotion, a more complex (certainly not less so) approach to the music itself, and resonates on a more direct (i.e. less abstract) level than purer “ambient” pieces ever could. Of course, that’s only my personal opinion. Not everything on Virga is confined to the neo-classical minimalist description from above, though. The opening title track features a rapid tempo piano theme played out against swirling keyboards, descending in a lush crescendo of sorts. “night flyers” opens amidst a nocturnal chorus of synthesized creatures set against shimmering synthesizers and a plaintive echoed piano. As he did on Winter Light‘s “Moving to Malaysia” and “Under the Pagoda,” Greinke again displays his affinity for Asian musical influences on “east facing slope” with gently plucked koto and delicate bell tones, joined by Morgan’s sonorous cello and Dalaba’s trumpet. “contrails” flows on airy layers of keyboards underneath echoed piano and the track could easily be classified as spacemusic especially when a particularly warm analog-ish sounding synthesizer is brought into focus. In the end, Virga is less “passive” yet also more ambient, at times, than Winter Light may have been perceived, but it’s a subtle distinction for the most part. If you, like me, love this new direction that Jeff Greinke is headed in, you will greatly enjoy delving into the many pleasures of Virga, walking down its paths of beauty tinted with wonder married to despair, and serenity clouded by mystery. By the way, it goes without saying that since this is a Lotuspike release, and mastered by Ben Cox, the sound is tremendous, rife with nuance and finely captured detail and expertly mixed and engineered from every perspective.